The G2 includes the Hammer Transfer Case. Packed with scale detail, the Hammer features a cast metal exterior and heavy duty .8 Mod Widened Gears for durability. The G2 includes a set of RC4WD Dual Spring Shocks. These ultimate scale shocks offer realistic looks and the ultimate in performance. They're machined from billet aluminum with dual springs and are completely rebuildable. The G2 includes a set of RC4WD Black Stamped Steel 1.9'' Internal Beadlock Wheels. These wheels provide a super tough black finish, aluminum internal locking ring and popular 5 Lug design with separate hub. The G2 is powered by the nearly indestructible RC4WD 45 Turn Crawler Motor. 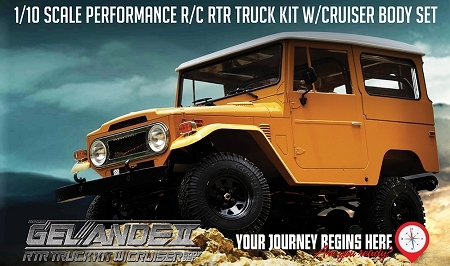 With its sealed endbell for increased durability and long lasting performance, you're sure to get where you're going! Featuring a massive 153oz@6V of torque and a full metal geared drivetrain, the RC4WD Twister Metal Gear Digital Servo has the power and per-formance you need when the turning gets tough.